Should the UK introduce a universal basic income? The universal basic income (UBI) is given to each citizen regardless of income and, by its sheer simplicity, reduces the inefficiency and scope of the state. A safety net should incentivise work for those who can, limit bureaucracy and market distortion and free individuals from government constraints. The UBI can achieve all of these objectives. Perhaps the most eye-catching argument in favour of the UBI is the claim that it does not reduce work incentives. Risks in individual cases will be inevitable but experiments thus far – such as those in Canada, Uganda and Kenya – have suggested that incentives to work are not perverted. For example, the Ugandan government found in its trial that the participants that received UBI actually invested it in business and attainment of skills and were subsequently 65% more likely to practise a skilled trade. Notably, they also worked an average of 25 hours more per month within four years, which works out as 17% more hours than the participants who didn’t receive it. Were this trend to be replicated in nationwide, it would mean that incentives to work are not visibly reduced or harmed by introducing UBI. This makes sense because we know that work provides dignity and identity and the level of UBI provided would not be substantial to live on. In the UK, were we to implement a UBI that was fiscally neutral (i.e. what we spend now on welfare) each citizen would receive £423 per month. Even at around £580 a month (roughly in line with Finland’s €800 sum) citizens would avoid involuntary poverty but still be incentivised to work for an income and decent standard of living. Another argument for the UBI is the benefits system of today. Benefits in complex, multitudinous forms only complicate markets – housing, energy and childcare for example. With a simple UBI, this could be avoided. A lump sum of money guaranteed to suffice for survival would entrust the market more and leave individuals freer to define their own subsistence. As libertarian Charles Murray suggests, civil society would thrive and help those in genuine need. What more could a libertarian want, individual freedom and a revival of voluntarism? The UBI is a means of ending the absurdity of a welfare system that enables people to rationally favour benefits instead of getting a job due to the inevitability that they will lose welfare payments upon doing so. With a UBI, low-paid jobs would be more attractive since another income would support you. There would be no excuse to avoid work. Finally, in offering this income assistance, wage floors could be eradicated. We are too aware of how damaging high minimum wages are to the market, to low-skilled people and to small businesses and so on. Imagine a world in which the labour market could be freed. This would clearly be better justified with a guaranteed income in place. Essentially, we ought to stop characterising a universal basic income with the Green Party, but claim it as our own. Instead of purposefully striving for equality, it could easily manifest itself as a promoter of freedom and smaller states, killing off bureaucracy and disabling much government interference. I must confess, I’m intrigued by the idea of a UBI. The welfare state is a dysfunctional nightmare. It’s horrifically expensive. It encourages dependency. It creates terrible incentives that discourage work, entrench poverty and break up families. The idea of sweeping away the whole sorry mess and replacing it with a single flat-rate payment is an attractive one. The costs saved in bureaucracy alone would be immense. But like many revolutionary ideas that seem superficially attractive at first, the devil is in the detail. The first problem with a basic income is the most obvious one. How much do we pay people? Too little, and it won’t be enough to live on. Too much and some people might decide it isn’t worth working at all. Then there’s the potential cost to taxpayers. To pay £576 a month (the amount proposed in Finland) to every British citizen over the age of 16 would cost £414 billion every year. Supporters of the idea argue that the costs could be recouped by eliminating all other welfare programmes, cutting spending elsewhere, or by raising taxes. Cutting spending is something we should be doing anyway. Raising taxes is a whole other discussion so I’ll just assume most readers (generally being small-state types) are against it. Both are likely to be politically difficult. But the real problems start when you implement a basic income, then try to take away the messy system of benefits and entitlements it is supposed to replace. 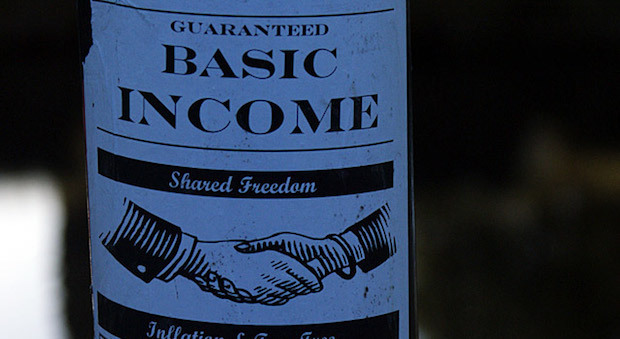 A basic income might actually work – if it replaced all other benefits. Unfortunately I’m not convinced that would ever be the case. Just try to abolish all benefits. See what happens next. Rioting in the streets on an unprecedented scale. Daily media scare stories about starving families and vulnerable individuals driven to suicide. Opposition politicians and opportunist rebels denouncing the ‘uncaring’ government at every given opportunity: Any government would have to be possessed of an iron will to resist that kind of pressure. The poll tax and George Osborne’s tax credits fiasco would look tiny in comparison. We’d most likely end up with the worst of all outcomes – an unreformed welfare state and a basic income. If the basic income is adopted in addition to the current welfare state, all of its benefits evaporate. Since everyone would be receiving an income top-up, welfare recipients would be slightly better off but still subject to the perverse effects of the welfare trap. Even if by some miracle the welfare state were abolished and replaced by a basic income, what happens if people waste the money they are given? Horror stories about starving children whose parents gambled away their basic income would likely become commonplace. Civil society would of course step in – as it did before the welfare state existed – but calls for government action would be constant. Piece by piece, something resembling the rotten welfare state we have now would be built back up and sooner or later we’d be back where we started. I voted yes – this really is just another rebranding of Milton Friedman’s negative income tax. But the key is, that it has to be done properly – it must be accompanied by replacing all other benefits, tax allowances, and ideally a single rate of flat tax (which is the same on income, capital gains and dividends). Of course the level it is set at also has to be affordable – and there I would also be radical. I would have the UBI paid by a hypothecated income tax that is also (conceptually) charged on UBI itself, and have levels only changed by plebiscite, so the voters have a direct connection to not just the money they get, but what they have to pay for it. Also since now everyone is guaranteed an income they can (just) live on, there is no need for a minimum wage, so that should be abolished at the same time. I think this is proposal the Conservatives should own – it is radical, easy to explain and once in place politically hard to change. These arguments have now been debunked, and more information can be found on Wikipedia or on the blogs of “Another Angry Voice” (AAV). For myself, I’m keen to see the UK move from a system based on coerced servitude to one based on enlightened participation, which I believe UBI would achieve.